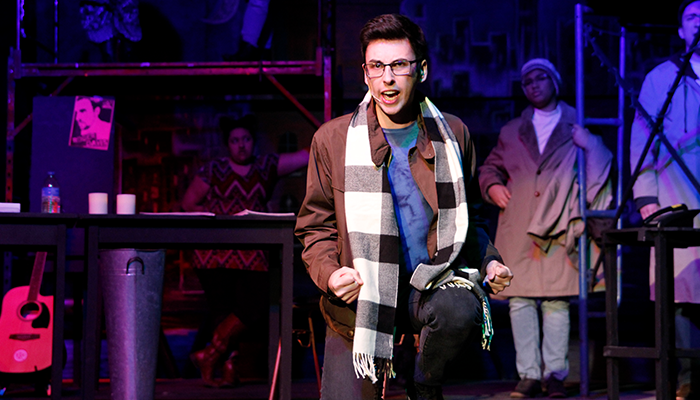 Voices of Cazenovia College students, staff, and local community members filled the Catherine Cummings Theatre this past April as they performed the rock musical RENT. Artist-in-Residence and Director David Lowenstein brought the acclaimed production to Cazenovia 10 years after its Broadway closing. Over 20 years after its original debut, and 13 years after the movie release, the story and its themes continue to be relevant among young adults. 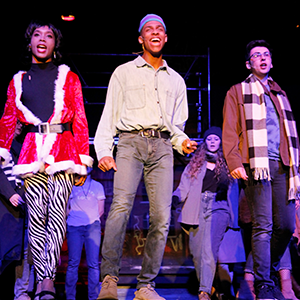 For those not familiar with the musical, RENT is a story of impoverished artists, created by Jonathan Larson, as a modern take on the iconic opera, La Bohème, by Giacomo Puccini. La Bohème was set in 1890s Paris. RENT is set in New York's East Village in the 1990s. The story conveys themes of impoverished artists, the celebration of chosen family, and friends coming together in life and in death. The spring performance received an exceptionally enthusiastic response from its audiences over the course of the two-week run. In addition to the support from area patrons who attended the performances, more than 300 Cazenovia College students also attended. The popularity of the musical, along with the strong student attendance, created an extraordinary feeling of comradery between performing students and those in attendance. *Cazenovia College student and faculty names appear in bold. Find upcoming events happening at the Catherine Cummings Theatre at http://www.cazenovia.edu/art-and-theatre/catherine-cummings-theatre.